Have you ever had one of those days when there’s almost nothing in your fridge so you toss a few ingredients together out of desperation, and by chance you unexpectedly create something marvellous? That’s the story of how this little salad came to be my number one go-to recipe this summer. I love it because it takes less than 10 minutes to make, it’s super healthy, it’s creamy, crunchy, delicious, and so refreshing on a hot day! 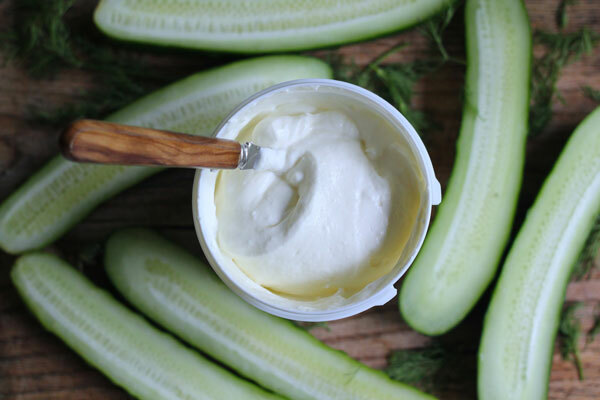 It has three basic ingredients: cucumber, chopped dill, and yoghurt. Garlic, salt and pepper are also added for a little flavor. 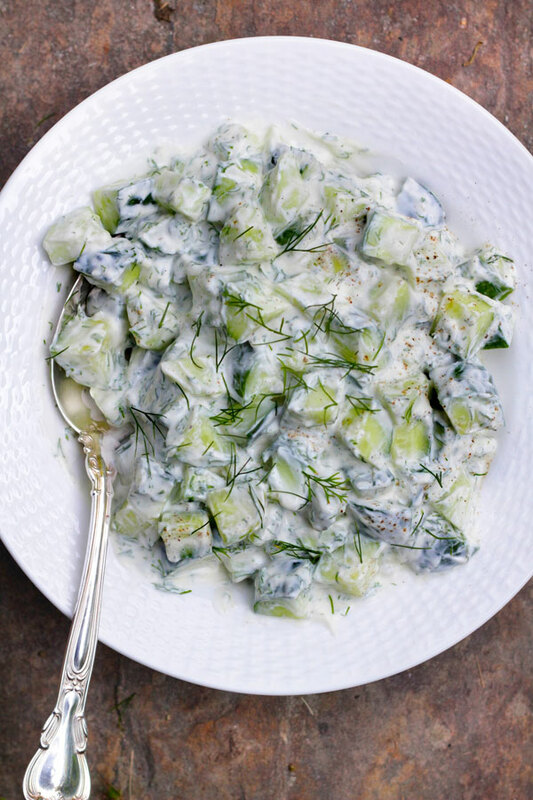 It’s very much like tzaziki, but chunkier since the cucumber is chopped instead of grated. You can also get creative and add various embellishments if you wish. A cup of sweet corn kernels is delicious, as is freshly chopped mint. Did you know cucumbers are 95% water, giving the humble veggie a place of honor alongside watermelon as one of summer’s most thirst-quenching treats? 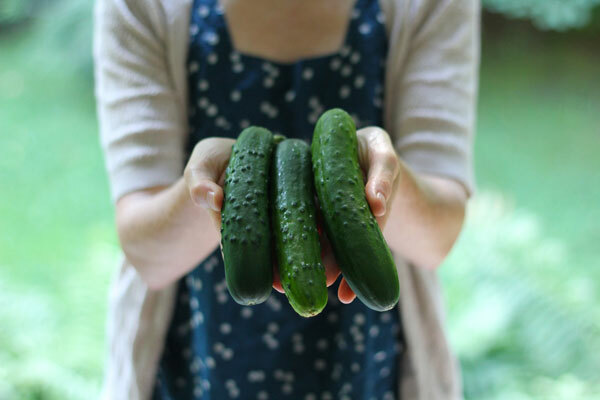 But don’t let its high water content fool you, cucumbers are also packed full of nutrients, including cancer-fighting compounds, B vitamins which are great energy boosters, and silica which is good for your joints. And if you’ve got organic cucumbers, be sure to leave the skins on because they’re high in vitamin C. However, if you can’t get organic cucumbers, I recommend peeling the skin because unfortunately, cucumbers are on the Environmental Working Group’s Dirty Dozen list as they are quite high in pesticide residues. Now, let’s talk about the yogurt. I implore you, please use whole milk full-fat yogurt in this recipe, it really makes a much better dish in my opinion. In fact, may I sing the praises of full-fat whole milk yogurt for a few moments? I’ve never understood why people are so afraid of whole milk yoghurt. Some of the latest research shows that milk fat won’t actually make you fat, in fact it’s quite the opposite. 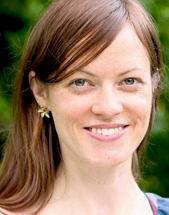 Studies published in the British Medical Journal and the European Journal of Nutrition have shown that paradoxically, high-fat milk is associated with a lower risk of obesity. And recent research published in the American Journal of Clinical Nutrition has shown that consumption of saturated fats does not increase the risk of heart and cardiovascular diseases or stroke, as we have previously been told. The research certainly seems to be ever-changing, but one thing is for sure, your body needs fat to absorb vitamins. So in this little salad, all those yummy milk fats are actually helping your body use up the vitamins in the cucumber! Having said all this, it’s true that toxins accumulate in animal fats, and our world is certainly a toxic-laden one. But the real health culprit in our dairy products is not the fat itself, but the way cows are raised. Cows raised on growth hormones, antibiotics, and pesticide-laden GMO grains (when their stomachs were designed to eat grass) will tend to produce milk that, not surprisingly, contains more toxic residues and less omega 3s (ie: the good fats!) than milk from organic and pasture-raised cows. So if you can find it and afford it, get the good stuff. It’s the healthiest and most delicious yoghurt you could possibly be eating. I’ve often thought I could deprive myself of all the luxuries in the world, but when it comes to my beloved dairy, I don’t think I’ll ever be able to compromise. There, now that I got all that off my chest (thank you for listening), if you still prefer to use low-fat yoghurt in this salad, don’t worry, we can still be friends. And on that note, I’m off to eat some more cucumber yoghurt dill salad. I hope you are too. Bon appétit! Rinse, then chop the cucumbers into bite-sized pieces, leaving the peels on. 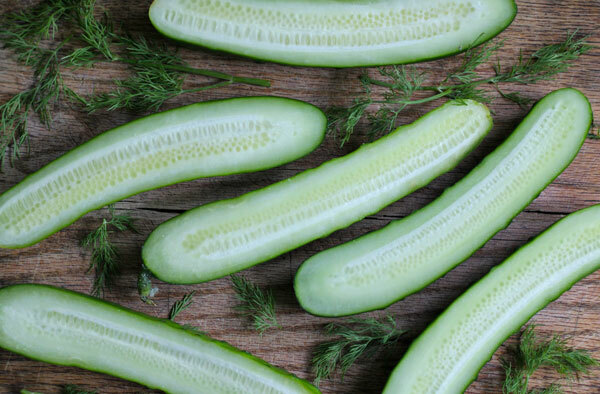 Rinse the fresh dill, shaking off the excess water and patting gently with a clean towel to dry. Chop finely. 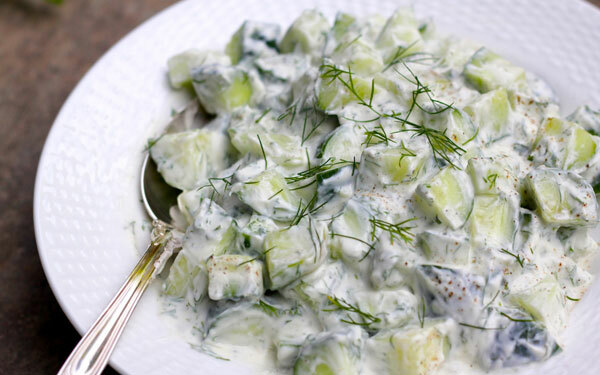 In a medium bowl, mix the yoghurt, cucumber, dill, crushed garlic clove, salt and pepper all together. Give it a good stir and serve immediately, or chill it in the fridge first if you prefer.